Replace tires that are worn, show uneven wear, or are damaged. Worn tires can cause loss of braking effectiveness, steering control, and traction. Always replace tires with the same size as each tire that was originally supplied with this vehicle. Using tires and wheels other than the recommended sizes could cause unusual handling characteristics, poor vehicle control, or negatively affect your vehicle’s Anti-Lock Brake System (ABS) resulting in a serious accident. Tires degrade over time, even when they are not being used. Regardless of the remaining tread, HYUNDAI recommends that tires be replaced after six (6) years of normal service. Heat caused by hot climates or frequent high loading conditions can accelerate the aging process. Failure to follow this warning may cause sudden tire failure, which could lead to a loss of vehicle control resulting in an accident. A compact spare tire has a shorter tread life than a regular size tire. 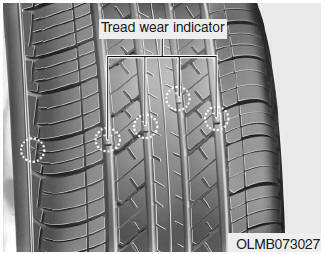 Replace it when you can see the tread wear indicator bars on the tire. The original tire should be repaired or replaced as soon as possible to avoid failure of the spare and loss of vehicle control resulting in an accident.The compact spare tire is for emergency use only. Do not operate your vehicle over 50 mph (80 km/h) when using the compact spare tire.